"My hope, of course, is that Russia is a country which understands there needs to be checks and balances, and free and fair elections, and a vibrant press," Bush said. Today was our Most Fabulous Company Christmas Party -- the format of which has not really changed in the ten years I've been with the company, on threat of mass mutiny by the employees. Dinner, gambling, bidding. It's a great party: first we have a great dinner (catered this year with much success), then we have a gambling company set up blackjack tables, poker tables, and a craps table -- and we gamble with "fake" money handed out by the boss, and finally there is an auction to buy all the neat techie gifts that the boss buys for us. We spend the time catching up with everyone that we don't see except once or twice a year, and it's really a blast. This year, we were supposed to bring slippers (new floors at the bosses house!) and I got a big laugh out of my Vorpal Bunny Slippers. Of course, I could only wear them for about four minutes, since my feet got so hot and sweaty. Seriously. The best christmas party -- it's perfect for hypercompetitive over-achievers, I always say. We didn't do so well gambling this year. I really need to learn how to play poker, that table was winning like crazy. Still, not too bad: The Adorable Husband got a new backup drive for his computer, and I got one of those digital frames. We all ate too many cookies, too. The Wacky Warning Label contest every year is always good for a few chuckles, and this year is no exception. I laughed out loud at the graphics on this sign from a tractor -- "Avoid Death!". That poor little stick figure is in for a bad day, I think. an iron-on T-shirt transfer that warns: "Do not iron while wearing shirt." a label on a baby-stroller featuring a small storage pouch that warns, "Do not put child in bag." a letter opener that says: "Caution: Safety goggles recommended." I can only imagine what sort of incident prompted the creation of those labels....Ha! BBC: "The US House of Representatives has approved a bill that would ban the CIA from using harsh interrogation techniques such as simulated drowning. The measure would require intelligence agencies to follow the rules adopted by the US Army, which forbid such methods, and to abide by the Geneva Conventions. President George Bush has threatened to veto the bill if the Senate passes it." Translation: Bush will veto a bill that requires him to obey the law. How's that War on Christmas going? A couple of thugs, one tattooed with pictures of Jesus, beat up a guy on a subway train in New York because he wished them a Happy Hanukkah when they offered a greeting of Merry Christmas. The group says that Adler and his group were drunk and taunting them first, of course. No one else has corroborated that part of the story, especially when the primary suspect in the assault already has a hate crime on his record. Sounds like a bunch of thugs just being thugs -- but does anyone else feel a bit nervous that this is the sort of response that knuckle-dragging mouth-breathers are going to think is a good thing? Celebrate the holidays however you want -- Christmas, Hanukkah, Kwanzaa, Festivus, Winter Solstice, whatever. Nearly every religious and quasi-religious group has a winter holiday, and the early history of Christianity coopted the Roman winter festival, just like the romans coopted earlier holy days. No one, ever, has suggested that Christians can't celebrate Christmas with all the religious fervor they can muster. What they don't understand, apparently, is that they can't force everyone else to celebrate in a way that they define. GWEN IFILL: Do you think that waterboarding, as I described it, constitutes torture? SEN. KIT BOND: There are different ways of doing it. It's like swimming, freestyle, backstroke. The waterboarding could be used almost to define some of the techniques that our trainees are put through, but that's beside the point. It's like swimming? It's something that we do all the time? Woah. And let's not forget: Bond is the ranking Republican on the Senate Intelligence Committee. This is the sort of expertise and advice we can expect? The rhetoric surrounding 'waterboarding' and all the wiffling and waffling about whether it's torture by the GOP candidates and congressmen is almost surreal. At one point, they admitted that yes, it was torture but it was necessary, then it's not torture; we do it, we don't; hell, the currrent AG seems to have a hard time even understanding what it is and can't define it during his hearings. What is wrong with these people? I'm going to suggest that the next congressperson who tries to sidestep the question by "not understanding what it is" should be used in a live demo on the floor of the Senate. Strap 'em down, tie a cloth over their face, and pour water into their mouths until they choke. Yup. Then let's see what they think of it. And let's start calling this what it really is, shall we? "Waterboarding" is a cutesy term that implies that this is akin to some vacation activity. It's called drowning, people. Not even simulated drowning, just drowning. And people are defending this? You may recall that after the Wine Festival that I posted about how we were converts to the Riedel Glasses. We've done the testing twice now, with four different people and the results have be been the same: California Chardonnay in the Riedel glasses is not the same wine as it is in the "regular" glasses. We've been stunned by how much the wine changes in the "right glass". So, for the Adorable Husband's birthday, I got him a set of four Riedel Single Malt Scotch glasses. He likes a wee dram now and then, and has a nice selection of very good single malts, so I thought it would be a nice addition. We tasted a very nice 18 -year-old Macallans last night...and the difference between the glasses is pretty startling. In a standard lowball glass, the nose is harsh and more like alcohol and peat, and (at least to me) the whiskey tastes more like peat and tobacco. In the Riedel glass? Smells like malt and caramel with a hint of smoke, and tastes sweeter and more complex --less overbearing peat and more like a peat smoke. Now we have to clear out a cabinet in the kitchen for all these glasses. Oy! The news has been abuzz with discussions of Mitt Romney's speech this week. Given that Mitt is Mormon, and therefore suspect to a large portion of American Evangelicals, he attempted to make his religious beliefs more palatable to the foundation voting block of the GOP. He wants the nomination. Since many evangelical christians do not consider Mormons christian (in fact, many consider them a bona-fide cult), even if he is a fabulous candidate, he has a lot of ground to cover to 'win them over'. It's not "courageous" to discuss his religion -- it would be courageous not to. Standing up and bluntly stating that your religious beliefs are personal and wholly irrelevant to your ability to do the job, that would be something newsworthy. In this campaign season, every single candidate, right or left, is trying desperately to cloak themselves in the Holy Aura of Religiosity in an attempt to garner votes. It's quite sickening, to be honest, and I would hope insulting to those people who really do believe, to have someone mouth platitudes about how they are so righteous and so pious....in an attempt to win votes. I'm fairly horrified by this, actually. While I do understand that people want to elect a president who shares their ideas and is "like" them, this test for religious belief is certainly anathema to the founding father's ideas. We are not a theocracy. The religious beliefs of our leaders -- as long as they perform their duties well -- is irrelevant. Well, perhaps that's not true if you believe as many evangelicals do, that morality can only come from god. And not just any god, mind you -- their specific idea of god. If you believe in a different one, or have a different collection of religious dogma and ritual, well, then you can't possibly be a good person. I really don't understand that particular piece of logic; especially since I am a staunch atheist and consider myself to be a moral and ethical person. Not sure how that fits into the idea that only religion can imbue people with morals....but I digress. The fact that the media and the watching public seem to believe that questions such as "do you believe in The Book? Do you believe in the literal truth of the bible" and "how does your faith instruct your decisions" are valid questions in the political arena is boggling to me. I try to base my voting on whether the person in question has the same views on issues as I do, whetherthey have voted the way I want them to, and whether they have a track history of following the same issues as I do. To think that you can determine all of that just by whether someone says that they are religious, to think that you can "know everything you need ot know" based on their answer of whether they accept Jesus...well, that bespeaks a non-critical, non-thinking, non-rational mode of decision-making that I can't get my head around. I know people who proclaim themselves to be christian who are good, honest, moral, and caring people. I also know people who proclaim themselves to be christian who are among the worst, most venal, least ethical people I know. Both would give the same answers to those questions. They'd say the same thing. If that's my only standard of measurement, then those two people would be equally acceptable candidates if I didn't look any further. And a lot of people don't seem to want to look any further than that. Now, I would hope that most people are not using that as a single yardstick. I'm sure most people are not. I truly hope most people are not. But to make anyone's religion an issue in a political election flies in the face of our very constitution, and smacks rational, reasonable discourse about political issues a good one right on the nose. No one religious group has dibs on "the truth", no matter what they claim. I find this phony "I'm more religious-er than you!" mudslinging in each debate to be distasteful. I'm sure a lot of people do. He even trotted out that old chestnut that the founding fathers really did! Really! design us a "christian nation" and really did promote the primacy of the protestant version of christianity as the basis for our country, and god (remember, the protestant christian god, not necessarily the Roman Catholic one) had a hand in shaping America through the revolution and establishment of our government. Mitt has spent a lot of time denying that he really does believe in the basis of his own faith -- Mormonism -- because so much of it is considered so "weird" by mainstream Christians. How can that be seen as honest? When an obviously intelligent and qualified presidential candidate has to abase himself to win the support of religious fanatics in order to be considered for nomination, we've got trouble with a capital-T, if you ask me. It might seem that I'm picking on Mitt Romney, it's not personal (although I'm not going to vote for him, I already know that) -- but his proclamations and statements about faith have been in the forefront lately. When candidates annouce that they will let God guide their decisions, that doesn't make me feel comforted. That makes me feel very, very nervous. It should make everyone feel nervous -- it's false, it's pandering, and it's politics as usual. I'm having issues finding a TV-tuner card that will work in my new computer (which isn't here yet, but this is a serious issue! I can find tons that mimic DVR (recording)and all sorts of bells and whistles, but I don't want any of that. I just want a simple, "watch tv on screen" card. My current one (which is TEN years old) uses an AGP connector, which is old technology and isn't even on the new computer motherboards. If I ever doubted that the Gaming computer users were driving the industry technically, I have only to listen to the plaintive comments of the Adorable Husband, whose existing computer "can't play the new game I just bought" (Call of Duty 4). I can't pick on him too much. I've done the same thing. "What do you mean that my video card won't play my new spiffy game at high resolution? I must immediately sally forth to buy a new video card and more memory!" Well, the Adorable Husband's problems cannot be solved with a new video card. His motherboard does not support PCI-Express, which is the current interface for video cards. Oh, there are a few older ones still around, that he could buy for his AGB-based system, but that would be like putting a tiny bandaid on a gunshot wound. Might patch things up for a few months, but even that would be an unsatisfactory experience. And did I ask why he doesn't just play the games on the XBox downstairs on the enormous screen? Of course. But sometimes that's too much of a hassle, he says. Sigh. Having clearly identified this as a want new computer situation vs a need new computer situation, we promptly went to Alienware to spec out new machines. What, us? Instant Gratification? Mine is getting up there in age, too, and while I'm not an avid gamer, there are a few new games that I like that don't run on my system, and -- as usual -- I can always use more space, so I'm looking for a machine, too. 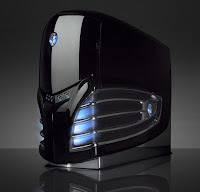 Besides, they offer a trade-in program for older machines, with a bonus for old Alienware machines. What more incentive do we need, we of the Propeller Beanie Geek Club? Besides, I was feeling a little left out -- he just got a new car (before me) and now is getting a new computer, too! So, for the tech weenies among you -- both machines are Intel Core 2 2.4 Ghz Q6600 Quad Cores w/1066 FSB, 2Gig memory, 512mg geForce 8800 GT video cards (2 for him, 1 for me), 1000w power supplies and liquid cooling, and his machine has 500Gig RAID0 SATA drives, while mine has 1T of space in RAID0. They may even arrive for Christmas. I'm seeing headlines all over the place that "Bush Disagrees with NIE assessment" -- the assessment that notes Iraq has no nuclear weapons program and has not actively worked on one since 2005. Well, of course he disagrees. Every statement he's made (including some pretty ominous ones about WWIII) has targeted Iran as a serious nuclear threat. Now, I don't dispute that Iran is a dangerous country, but it appears, once again, that Bush simply ignored the real intelligence data and continued on his stated path. THE PRESIDENT: David, I don't want to contradict an august reporter such as yourself, but I was made aware of the NIE last week. In August, I think it was Mike McConnell came in and said, we have some new information. He didn't tell me what the information was; he did tell me it was going to take a while to analyze. [...] And it wasn't until last week that I was briefed on the NIE that is now public. I guess hearing that there was "new information" in August and not even asking a few simple questions about it -- in fact, apparently not giving it a second thought for five months -- is acceptable to someone. I guess since it's the Shrub we just shrug and say, well, he's not very inquisitive. I'm sorry, this is considered the proper way to handle things for a US President? This is becoming almost surreal. And the contradictions of whether Bush received the 'stand down' order and ignored it, or didn't receive it at all (both stories came out of the WH in the last day)...I don't know about you, but I'm just feeling more confident in this administration, aren't you? Dates are flying back and forth furiously, the latest of which entirely contradict Bush's statement (and security advisor Stephen Hadley's assurances) that Bush was briefed on November 28th, even though he had two meetings with Ehud Olmert and discussed the contents of the NIE several days before. It's not the mismatch of dates and frantic who-knew-what-when that bothers me -- although that is what is going to dominate the story, I'm sure -- it's that it's clear that the President ignored valid intelligence analysis because it disagreed with his stated plan and he would have had to actually adjust his decisions. Nope, can't do that. Must stay the course and sling whatever loaded words and actions are necessary to look like he was right. So now, the papers are saying that Bush disputes the findings of the intelligence community (which he has carefully and repeatedly "explained" to us required time to correctly analyze the data, and did so between August and December), and he continues to warn that despite all actual evidence to the contrary, we still need to worry about nuclear weapons in Iran. In fact, the rhetoric seems to have gone up a notch. Of course, this is being presented as a failure of US intelligence, with Bush bravely standing up and talking the big talk, but now being sadly undercut by failures of his own people to give him good information. Sorry, I'm not buying that particular steaming pile again. It's all sounding a little bit too much like the information bandied around before the invasion of Iraq. There was no failure of US intelligence. The NIE conclusion, that Iran is not actively pursuing nuclear weapons, is entirely correct and intelligent. The failure of intelligence is entirely in the White House. Lots of people complain about their MILs...and I can gloat that my MIL comes to my house and bakes ! We managed to avert a minor disaster, though. I was having visions of having to go retrieve them from Homeland Security possession for bringing "unidentified powder" in an airplane. We didn't think that the TSA would approve of bringing baking ingredients in ziplock baggies on the plane! Luckily, it was easy enough to find the ingredients she needed here -- Demerera sugar and Muscovado sugar, both forms of raw cane sugar, are called for in the recipe. I have a feeling that we're going to be spending a lot of time lounging about the kitchen eating Cinnamon Buns! Remember that scene in Jurassic Park when we first get an inkling that the creature in the cage is not your average run-of-the-mill lion or tiger? 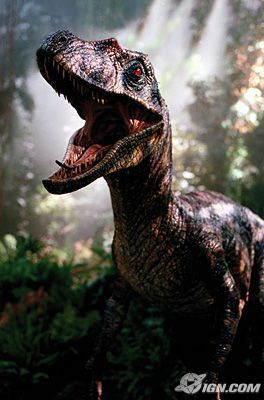 That first introduction to the velociraptors? We've decided that we need to start referring to the puppies as Velociraptors instead of Crazed Weasels. All I hear is high-pitched whistles and yelps and then the bushes in the back yard start shaking wildly. More yipping and shrieking and then the puppies careen out from behind the shrubbery, race like mad creatures around the yard and repeat the process every four seconds for an hour and a half.